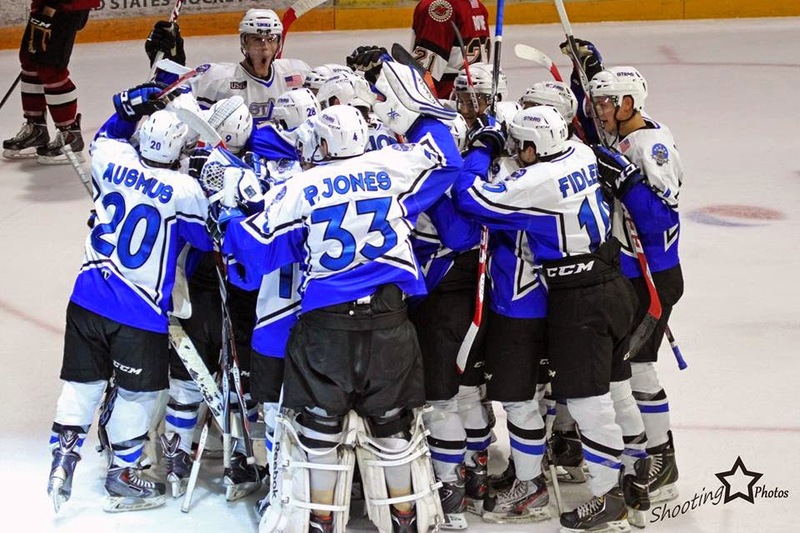 The Lincoln Stars rebounded from Friday's loss to Muskegon with a hard-earned 4-3 victory over the Lumberjacks Saturday night at the IceBox. With the win and the two points, the Stars improved to 2-3-0 (four points) and currently sit in sixth place in the USHL western conference standings. Click here to view the current USHL standings. The shot total might not indicate how well the Stars played in the first period, but I thought Lincoln showed a better sense of urgency in the first twenty minutes compared to what I saw on Friday night against this same team. The Stars took advantage of a powerplay opportunity late in the first period to get on the scoreboard first thanks to a heads-up play by forward Michael Gillespie. After a PP shot on goal by Dominick Sacco was blocked by Muskegon, the rebound went to a wide open Gillespie who quickly ripped a shot past Muskegon netminder Michael Latorella. Stars took the 1-0 lead into the first intermission break. Shots were 13-4 in favor of Muskegon, but many in attendance thought that total was far from correct. I know for sure that the Stars had more than 4 shots on goal in that first period. I'm not sure who is responsible for counting shots on goal, but Stars head coach Chris Hartsburg didn't agree with the totals either. The bulk of the scoring in this particular game came in the middle stanza, as both teams combined for 5 goals, with three of those five coming from the Stars. Just 22 seconds into the 2nd period, Stars defenseman Cam Lee scored his second goal of the weekend against the team that originally drafted him. Some water on the ice in the Muskegon offensive zone allowed the puck to sit for a streaking Lee who slapped it past Latorella to give Lincoln a 2-0 lead. The next four goals scored in the second would be traded one at a time between Lincoln and Muskegon. First it was a goal-mouth scramble in front of Stars goaltender Cam Hackett that gave the 'Jacks their first goal of the game. Lincoln's next goal came on a terrific individual effort by forward Patrick Polino in which he drove hard to the net and backhanded a shot past Latorella for his first goal in a Stars uniform. On that play, forward Blake Christensen had a great head man pass to the streaking Polino who put it in sixth gear and blew past the Muskegon defender. Polino's parents happened to be sitting next to my wife and I last night, so it was really cool to see their reactions after their son scored. Very nice people. 'Jacks forward Matheson Iacopelli scored the first of his two goals on the night later in the 2nd period to pull his team to within one goal at 2-3. Both teams were playing 4-on-4 hockey, and Iacopelli ripped a shot right off a faceoff past Hackett. However, the Stars answered just a little over a minute later thanks to some hard work by Patrick Polino and Michael Gillespie. Gillespie worked to get the puck off the boards in the Lincoln zone to Polino who skated quickly up the ice and into the Muskegon zone. Polino put on the brakes just before feathering the puck to Gillespie who had beaten his man and was streaking to the net. Polino's pass was right on target to Gillespie who redirected the puck past Latrorella. Great example here of the team speed that the Stars have this year. Thanks to Gillespie's second goal of the game, the Stars took a 4-2 lead into the 2nd intermission. Shots were 11-10 in favor of Lincoln in the second period. In the third, the 'Jacks threw everything but the kitchen sink at Cam Hackett but were only able to score one goal. Shots were 20-4 in favor of Muskegon in the final twenty minutes, but again you could argue those shots totals aren't exactly accurate. The 'Jacks certainly controlled play for most of the third, but the Stars did a good job of minimizing the offensive chances against. The final shot total was 43-19 in favor of Muskegon. Lincoln went 1-for-3 on the powerplay, while the 'Jacks went 1-for-4 with the man advantage. Stars netminder Cam Hackett finished with 40 saves on 43 shots on goal, but somehow wasn't named one of the three stars of the game. I thought Hackett played his best game in a Lincoln Stars uniform Saturday night against Muskegon. There were quite a few times late in the third period that Hackett stood on his head and prevented the 'Jacks for scoring the tying goal. Nice to see the Stars finish out the weekend with a win against a quality team. It's obvious that consistency will be an issue with this team early on, but as they grow I'm positive we'll see that improve. Lincoln's first five games of the season were at home, but the next three games will be on the road. This coming Thursday and Friday, the Stars will be in Fargo, ND to face the Force The upcoming road series against the Fargo Force should be a good one. Fargo is out to a very good start, going 4-1-0 in their first five games. I'll post more about that matchup here in the next few days. Thanks for reading. Go Stars.